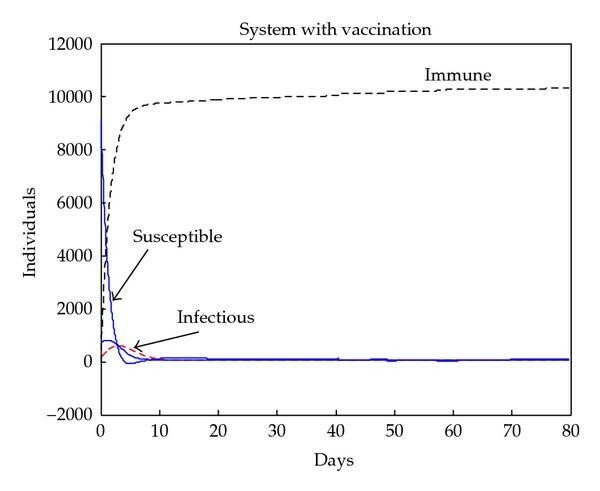 This paper discusses a generalized time-varying SEIR propagation disease model subject to delays which potentially involves mixed regular and impulsive vaccination rules. The model takes also into account the natural population growing and the mortality associated to the disease, and the potential presence of disease endemic thresholds for both the infected and infectious population dynamics as well as the lost of immunity of newborns. The presence of outsider infectious is also considered. It is assumed that there is a finite number of time-varying distributed delays in the susceptible-infected coupling dynamics influencing the susceptible and infected differential equations. It is also assumed that there are time-varying point delays for the susceptible-infected coupled dynamics influencing the infected, infectious, and removed-by-immunity differential equations. 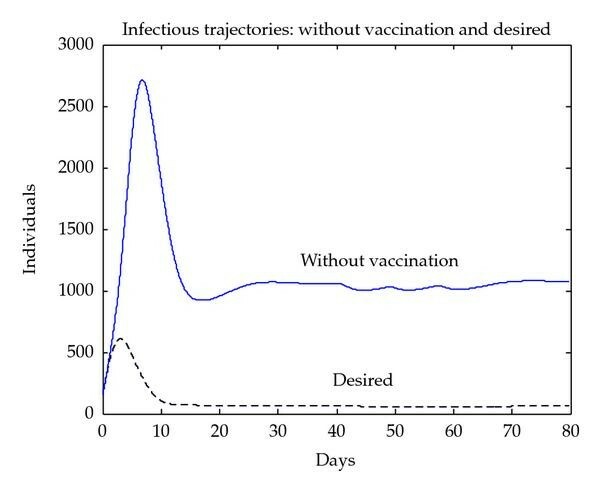 The proposed regular vaccination control objective is the tracking of a prescribed suited infectious trajectory for a set of given initial conditions. The impulsive vaccination can be used to improve discrepancies between the SEIR model and its suitable reference one. SEIR models where the infected populations are split into two ones (namely, the "infected" which incubate the disease but do not still have any disease symptoms and the "infectious" or "infective" which do exhibit the external disease symptoms). The three above models have two possible major variants, namely, the so-called "pseudo-mass action models," where the total population is not taken into account as a relevant disease contagious factor or disease transmission power, and the so-called "true mass action models," where the total population is more realistically considered as being an inverse factor of the disease transmission rates. There are other many variants of the above models, for instance, including vaccination of different kinds: constant , impulsive , discrete-time, and so forth, by incorporating point or distributed delays [12, 13], oscillatory behaviors , and so forth. On the other hand, variants of such models become considerably simpler for the disease transmission among plants [6, 7]. In this paper, a mixed regular continuous-time/impulsive vaccination control strategy is proposed for a generalized time-varying SEIR epidemic model which is subject to point and distributed time-varying delays [12, 13, 15–17]. The model takes also into account the natural population growing and the mortality associated to the disease as well as the lost of immunity of newborns, [6, 7, 18] plus the potential presence of infectious outsiders which increases the total infectious numbers of the environment under study. The parameters are not assumed to be constant but being defined by piecewise continuous real functions, the transmission coefficient included . Another novelty of the proposed generalized SEIR model is the potential presence of unparameterized disease thresholds for both the infected and infectious populations. It is assumed that a finite number of time-varying distributed delays might exist in the susceptible-infected coupling dynamics influencing the susceptible and infected differential equations. It is also assumed that there are potential time-varying point delays for the susceptible-infected coupled dynamics influencing the infected, infectious, and removed-by-immunity differential equations [20–22]. The proposed regulation vaccination control objective is the tracking of a prescribed suited infectious trajectory for a set of given initial conditions. The impulsive vaccination action can be used for correction of the possible discrepancies between the solutions of the SEIR model and that of its reference one due, for instance, to parameterization errors. It is assumed that the total population as well as the infectious one can be directly known by inspecting the day-to-day disease effects by directly taking the required data. Those data are injected to the vaccination rules. Other techniques could be implemented to evaluate the remaining populations. For instance, the infectious population is close to the previously infected one affected with some delay related to the incubation period. Also, either the use of the disease statistical data related to the percentages of each of the populations or the use of observers could be incorporated to the scheme to have either approximate estimations or very adjusted asymptotic estimations of each of the partial populations. SEIR epidemic model, namely, that consisting of four partial populations related to the disease being the susceptible, infected, infectious, and immune. : Functions that and are, respectively, the instantaneous durations per populations averages of the latent and infectious periods at time . : Weighting functions associated with distributed delays in the SEIR model. and which give sense of the asymptotic limit of the trajectory solutions. is the total population at time . The following functions parameterize the SEIR model. is a bounded piecewise-continuous function related to the natural growth rate of the population. is assumed to be zero if the total population at time is less tan unity, that is, , implying that it becomes extinguished. is a bounded piecewise-continuous function meaning the natural rate of deaths from causes unrelated to the infection. is a bounded piecewise-continuous function which takes into account the immediate vaccination of new borns at a rate . is a bounded piecewise-continuous function which takes into account the number of deaths due to the infection. is a bounded piecewise-continuous function meaning the rate of losing immunity. is a bounded piecewise-continuous transmission function with the total number of infections per unity of time at time . is a transmission term accounting for the total rate at which susceptible become exposed to illness which replaces in the standard SEIR model in (2.1)–(2.2) which has a constant transmission constant . It generalizes the one-delay distributed approach proposed in  for a SIRS-model with distributed delays, while it describes a transmission process weighted through a weighting function with a finite number of terms over previous time intervals to describe the process of removing the susceptible as proportional to the infectious. The functions , with are nonnegative weighting real functions being everywhere continuous on their definition domains subject to Assumption 1(1) below, and are the relevant delay functions describing the delay distributed-type for this part of the SEIR model. Note that a punctual delay can be modeled with a Dirac-delta distribution within some of the integrals and the absence of delays is modeled with all the functions being identically zero. are bounded continuous functions defined so that and are, respectively, the instantaneous durations per populations averages of the latent and infective periods at time . are piecewise-continuous functions being integrable on any subset of which are threshold functions for the infected and the infectious growing rates, respectively, which take into account (if they are not identically zero) the respective endemic populations which cannot be removed. This is a common situation for some diseases like, for instance, malaria, dengue, or cholera in certain regions where they are endemic. are single point-delay and two-point delay dynamic terms linked, respectively, to the couplings of dynamics between infected-versus-infectious populations and infectious-versus-immune populations, which take into account a single-delay effect and a double-delay effect approximating the real mutual one-stage and two-staged delayed influence between the corresponding dynamics, where are the gain and their associate infected and infectious delay functions which are everywhere continuous in . In the time-invariant version of a simplified pseudomass-type SIRS-model proposed in , the constant gains are and . in (2.1) and (2.4) are nonnegative nonidentically zero vaccination weighting real functions everywhere on their definition domains subject to distributed delays governed by the functions where , with is a vaccination function to be appropriately normalized to the day-to-day population to be vaccinated subject to . As for the case of the transmission term, punctual delays could be included by using appropriate Dirac deltas within the corresponding integrals. The SEIR model is subject to a joint regular vaccination action plus an impulsive one at a strictly ordered finite or countable infinite real sequence of time instants . Specifically, it is a single Dirac impulse of amplitude if and zero if . The weighting function can be defined in several ways. For instance, if when , and , otherwise, then when and it is zero, otherwise. Thus, the impulsive vaccination is proportional to the total population at time instants in the sequence . If , then the impulsive vaccination is proportional to the susceptible at such time instants. The vaccination term in (2.1) and (2.4) is related to a instantaneous (i.e., pulse-type) vaccination applied in particular time instants belonging to the real sequence if a reinforcement of the regular vaccination is required at certain time instants, because, for instance, the number of infectious exceeds a prescribed threshold. Pulse control is an important tool in controlling certain dynamical systems [15, 23, 24] and, in particular, ecological systems, [4, 5, 25]. Pulse vaccination has gained in prominence as a result of its highly successfully application in the control of poliomyelitis and measles and in a combined measles and rubella vaccine. Note that if , then neither the natural increase of the population nor the loss of maternal lost of immunity of the newborns is taken into account. If , then some of the newborns are not vaccinated with the consequent increase of the susceptible population compared to the case . If , then such a lost of immunity is partly removed by vaccinating at birth a proportion of newborns. There exist continuous functions with such that for some prefixed and any given . Assumption 1(1) for the distributed delay weighting functions is proposed in . Assumption 1(2) implies that the infected and infectious minimum thresholds, affecting to the infected, infectious, and removed-by-immunity time derivatives, may be negative on certain intervals but their time-integrals on each interval on some fixed nonzero measure is nonnegative and bounded. This ensures that the infected and infectious threshold minimum contributions to their respective populations are always nonnegative for all time. From Picard-Lindelöff theorem, it exists a unique solution of (2.1)–(2.5) on for each set of admissible initial conditions and each set of vaccination impulses which is continuous and time-differentiable on for time instant , provided that it exists, being such that , or on , if such a finite impulsive time instant does not exist, that is, if the impulsive vaccination does not end in finite time. The solution of the generalized SEIR model for a given set of admissible functions of initial conditions is made explicit in Appendix A.
if there is no finite such that and, then, the sequence ST is infinite and the set has infinite cardinal. The following result is obtained from the above discussion under conditions which guarantee that the candidate is bounded for all time. what leads to if which again contradicts that as and it is a weaker condition than the above one. Note that the above condition is much more restrictive in general than that of Theorem 3.1 although easier to test. Since the impulsive-free SEIR model (2.1)–(2.5) has a unique mild solution (then being necessarily continuous) on , it is bounded for all finite time so that Theorem 3.1 is guaranteed under an equivalent simpler condition as follows. Corollary 3.3 may also be simplified to the light of more restrictive alternative and dependent on the parameters conditions which are easier to test, as it has been made in Theorem 3.1. The following result, which is weaker than Theorem 3.1, holds. for some constants and some prefixed finite . Then, the total population of the SEIR model is nonnegative and bounded for all time, and asymptotically extinguishes at exponential rate irrespective of the vaccination law. then the total population of the SEIR model is nonnegative and bounded for all time. The proof of Theorem 3.4 is given in Appendix B. The proofs of the remaining results which follow requiring mathematical proofs are also given in Appendix B. Note that the extinction condition of Theorem 3.4 is associated with a sufficiently small natural growth rate compared to the infection propagation in the case that the average immediate vaccination of new borns (of instantaneous rate ) is less than zero. Another stability result based on Gronwall's Lemma follows. for some prefixed finite . Then, the total population of the SEIR model is nonnegative and bounded for all time irrespective of the vaccination law. Furthermore, converges to zero at an exponential rate if the above second inequality is strict within some subinterval of of infinite Lebesgue measure. Note that the infectious population is usually known with a good approximation (see Remark 3.2). The vaccination effort depends on the total population and has two parts, the continuous-time one and the impulsive one (see (2.1) and (2.4)). The non-negativity of any considered partial population is equivalent to the sum of the other three partial populations being less than or equal to the total population. Then, the following result holds from (3.3) and (4.1) concerning the non negative of the solution of the susceptible population for all time. Then, the following result holds concerning the non negativity of the infected population. Thus, we have the following result concerning the non negativity of the infectious population. Then, the following result holds concerning the non negativity of the immune population. Assertions 1–4, Theorem 3.1, Corollary 3.3, and Theorems 3.4-3.5 yield directly the following combined positivity and stability theorem whose proof is direct from the above results. If Assertions 1–4 hold jointly, then, the populations , and in the generalized SEIR model (2.1)–(2.5) are lower bounded by zero and upper bounded by . If, furthermore, either Theorem 3.1, or Corollary 3.3, or Theorem 3.4 or Theorem 3.5 holds, then , , , and are bounded . either Theorem 3.1, or Corollary 3.3, or Theorem 3.4 or Theorem 3.5 holds, then , , and are bounded . Then, the populations , , , and of the generalized SEIR model (2.1)–(2.5) are lower bounded by zero and upper bounded by what is, in addition, bounded, . The following positivity results for the solution of (2.1)–(2.4), subject to (2.5), are direct and easy to test. for some sufficiently small . The positivity of the susceptible population has to be kept also in the absence of vaccination. In this way, note that if Assertion 5 holds for a given vaccination function and a given impulsive vaccination distribution , then it also holds if those vaccination function and distribution are identically zero. The following result follows from (2.3) and it is proved in a close way to the proof of Assertions 5–7. The subsequent result is related to the first positivity interval of all the partial susceptible, infected, infectious, and immune populations under not very strong conditions requiring the (practically expected) strict positivity of the susceptible population at , the infected-infectious threshold constraint and a time first interval monitored boundedness of the infectious population which is feasible under the technical assumption that the infection spread starts at time zero. Then, , and irrespective of the delays and vaccination laws that satisfy (even if the SEIR model (2.1)–(2.5) is vaccination free). Furthermore, , , irrespective of the delays and vaccination law even if the SEIR model (2.1)–(2.5) is vaccination-free. Note that , that is, the set of impulsive time instants in is identical to that in if and only if and includes if and only if . Note also that if and only if , in particular, if . A related result to Assertion 9 follows. Assume that the constraints of Assertion 9 hold except that is replaced by . Then, the conclusion of Assertion 9 remains valid. A positivity result for the whole epidemic model (2.1)–(2.5) follows. Then, its unique mild solution is nonnegative for all time. Theorem 4.3 is now directly extended to the presence of impulsive vaccination as follows. The proof is direct from that of Theorem 4.3 and then omitted. Assume that the hypotheses of Theorem 4.3 hold and, furthermore, such that . Then, the solution of the SEIR model (2.1)–(2.5) is nonnegative for all time. A problem of interest is the calculation of a vaccination law such that a prescribed suitable infectious trajectory solution is achieved for all time for any given set of initial conditions of the SEIR model (2.1)–(2.5). The remaining solution trajectories of the various populations in (2.1)–(2.4) are obtained accordingly. In this section, the infected trajectory is calculated so that the infectious one is the suitable one for the given initial conditions. Then, the suited susceptible trajectory is such that the infected and infectious ones are the suited prescribed ones. Finally, the vaccination law is calculated to achieve the immune population trajectory such that the above suited susceptible trajectory is calculated. In this way, the whole solution of the SEIR model is a prescribed trajectory solution which makes the infectious trajectory to be a prescribed suited one (for instance, exponentially decaying) for the given delay interval-type set of initial condition functions. The precise mathematical discussion of this topic follows through Assertions 11–13 and Theorem 5.1 below. with initial conditions being identical to those of . Then, the infected population trajectory (5.1) guarantees the exact tracking of the infectious population of the given reference infectious trajectory which furthermore satisfies the differential equation (2.3). is in under initial conditions with being given by (5.2) with initial conditions . Then, the susceptible population trajectory (5.3), subject to the infected one (5.1), guarantees the exact tracking of the infectious population of the given reference infectious trajectory with the suited reference infected population differential equation satisfying (2.2). which follows from (2.1) and (A.8), such that and . 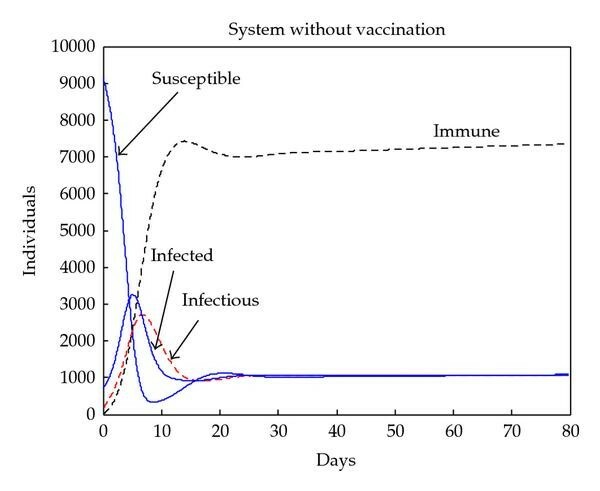 Then, the immune population trajectory (5.7)-(5.8), subject to the infected one (5.1) and the susceptible one (5.3), guarantees the exact tracking of the infectious population of the given reference infectious trajectory with the infected, susceptible, and immune population differential equations satisfying their reference ones (2.1), (2.3), and (2.4). Note that the regular plus impulsive vaccination law (5.5)-(5.6) ensures that a suitable immune population trajectory (5.7)-(5.8) is achieved. The combination of Assertions 11–13 yields the subsequent result. The vaccination law (5.5)–(5.6) makes the solution trajectory of the SEIR model (2.1)–(2.5), to be identical to the suited reference one for all time provided that their functions of initial conditions are identical. The impulsive part of the vaccination law might be used to correct discrepancies between the SEIR model (2.1)–(2.5) and its suited reference solution due, for instance, to an imperfect knowledge of the functions parameterizing (2.1)–(2.4) which are introduced with errors in the reference model. The following result is useful in that context. Assume that for some and any given . Then, (prescribed) if with so that . Note that guarantees the existence of a unique solution of (2.1)–(2.4) for each set of admissible initial conditions and a vaccination law. Corollary 5.2 is useful in practice in the following situation due to errors in the SEIR model (2.1)–(2.5) for some prefixed unsuitable sufficiently large . Then, an impulsive vaccination at time may be generated so that . Extensions of the proposed methodology could include the introduction of hybrid models combining continuous-time and discrete systems and resetting systems by jointly borrowing the associate analysis of positive dynamic systems involving delays [15, 16, 26–28]. This section contains a simulation example concerning the vaccination policy presented in Section 5. The free-vaccination evolution and then vaccination policy given in (5.5)-(5.6) are studied. The case under investigation relies on the propagation of influenza with the elementary parameterization data previously studied for a real case in [7, 29], for time-invariant delay-free SIR and SEIR models without epidemic threshold functions. In the first subsection below, the ideal case when the parameterization is fully known is investigated while in the second subsection, some extra simulations are given for the case where some parameters including certain delays are not fully known in order to investigate the robustness against uncertainties of the proposed scheme. 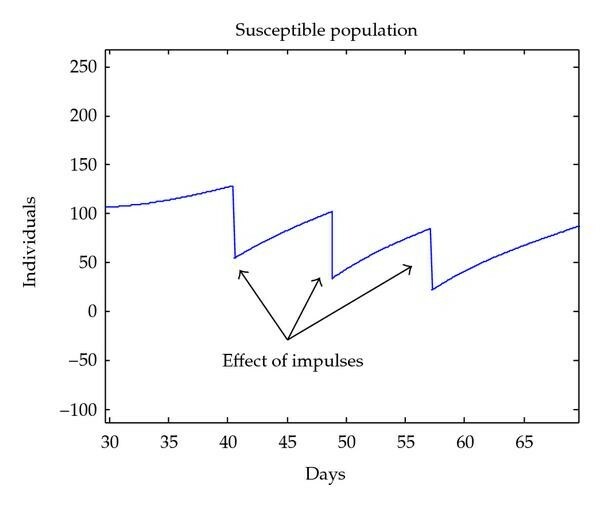 The time-varying parameters of the system described by equations (2.1)–(2.4) are given by: , which represent periodic oscillations around fixed values given by , days, (the natural growth rate is larger than the natural death rate), days, days, , and , which means that the 80% of newborns are immediately vaccinated. The frequency is , where the period , in the case of influenza, is fixed to one year. The remaining parameters are given by: per day, per day, per day, (a constant total contribution of external infectious is assumed), and the delays days, days, days, days, days, and days. The weighting functions are given by , , . The initial conditions are punctual at with , and individuals and remain constant during the interval days. 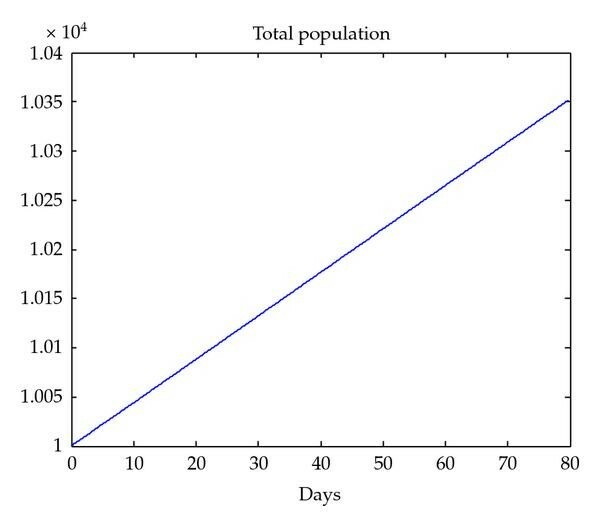 The population evolution behavior without vaccination is depicted in Figure 1 while the total population is given by Figure 2. Evolution of the populations without vaccination. Evolution of the total population. As it can be appreciated from Figure 2, the total population increases slightly with time as it corresponds to a situation where the natural growth rate is larger than the combination of the natural and illness-associated death rates. As Figure 1 points out, the infectious trajectory possesses a peak value of 2713 individuals and then it stabilizes at a constant value of 1074 individuals. The goals of the vaccination policy are twofold, namely, to decrease the trajectory peak and to reduce the number of infected individuals at the steady-state. The vaccination policy of (5.5)-(5.6) is implemented to fulfil those objectives. 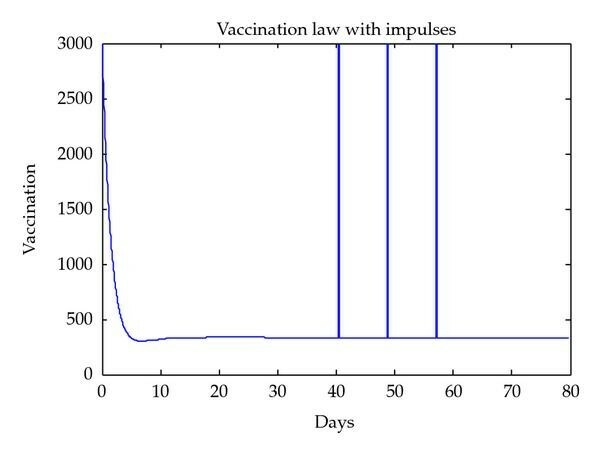 The desired infectious trajectory to be tracked by the vaccination law is selected as shown in Figure 3. Note that the shape of the desired trajectory is similar to the vaccination-free trajectory but with the above-mentioned goals incorporated: the peak and the steady-state values are much smaller. 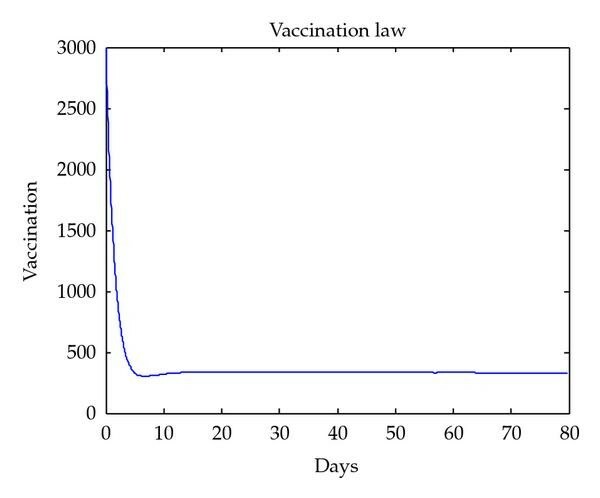 The partial populations are depicted in Figure 4 when the vaccination law (5.5)-(5.6) is implemented. On one hand, the populations reach the steady-state very quick. 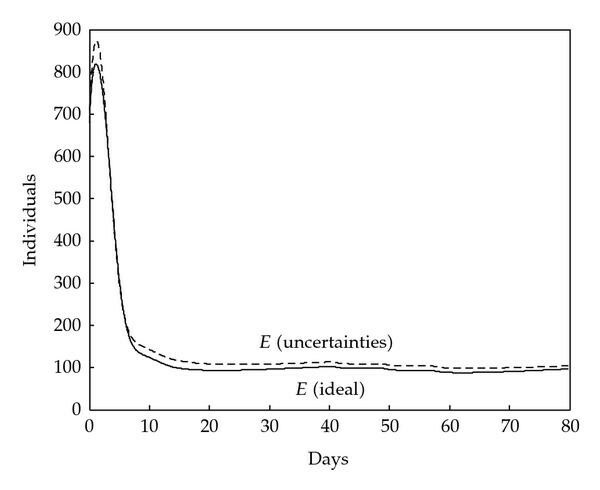 This occurs since the desired infectious trajectory reaches the steady-state in only 10 days. On the other hand, the above-proposed goals are fulfilled as Figure 5 following on the infectious trajectory shows. Comparison between real and desired trajectories. The peak in the infectious reaches only 607 individuals while the steady-state value is 65 individuals. These results are obtained with the vaccination policy depicted in Figure 6. 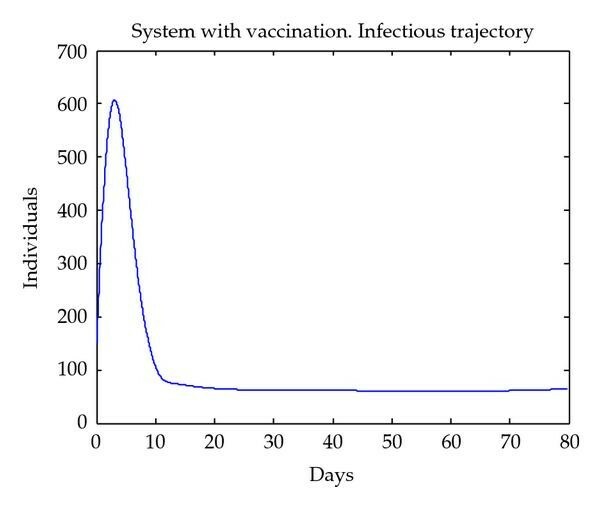 The vaccination effort is initially very high in order to make the system satisfies the desired infectious trajectory. Afterwards, it converges to a constant value. Moreover, note that with this vaccination strategy, the immune population increases while the susceptible, infected, and infectious reduces in comparison with the vaccination-free case. However, since the total population increases in time (Figure 2), the number of susceptible and infected individuals would also increase through time as the infectious population remains constant. In order to reduce this effect, an impulse vaccination strategy is considered. The vaccination impulses according to the law (5.6) are injected in order to increase the immune population by 100 individuals while removing the same number of individuals from the susceptible. 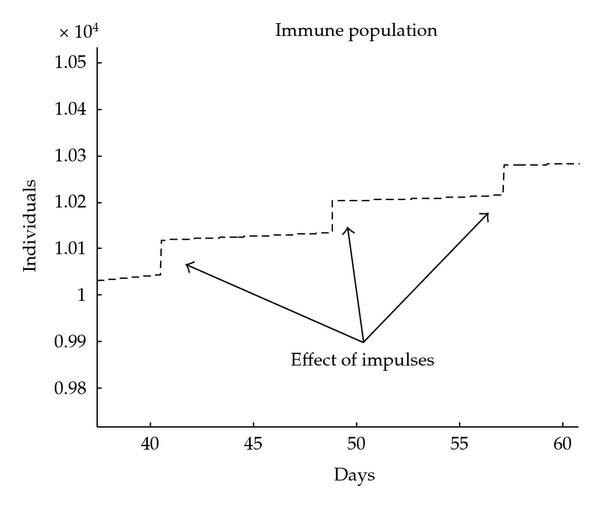 Figures 7 and 8 display a zoom on the immune and susceptible populations when the impulsive effect is considered. The vaccination law is shown in Figure 9. Immune population evolution with impulse vaccination. Susceptible population evolution with impulse vaccination. Note that the impulsive vaccination allows to improve the numbers of the immune population at chosen time instants, for instance, in cases when the total population increases through time while the disease tends to spread rapidly. This subsection contains some numerical examples concerning the case when small uncertainties in some of the parameters of the system are present. In particular, the new values for the parameters are: days, , and especially, the modified delays are: , and days. Furthermore, a small uncertainty in the initial susceptible and infected populations is considered with and instead of 9172 and 150, respectively, taken as initial nominal values. The following Figures 10, 11, and 12 show the ideal responses for the infectious, infective, and immune and the ones obtained when the real system possesses different parameters (i.e., system with uncertainties). 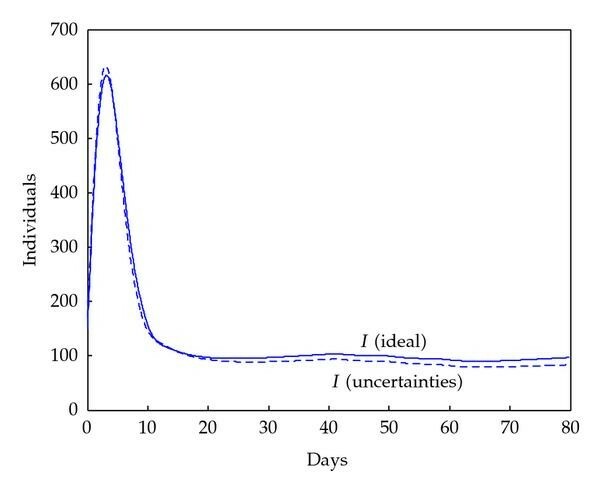 Infectious evolution in the presence of small uncertainties. 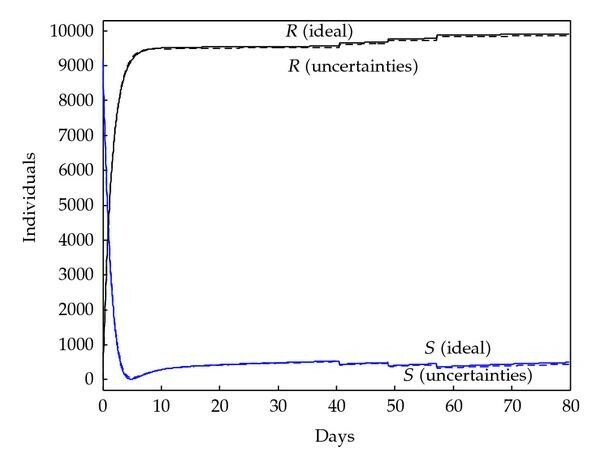 Infected evolution in the presence of small uncertainties. Immune evolution in the presence of small uncertainties. As it can be deduced from Figures 10, 11, and 12, the proposed vaccination strategy is robust to small uncertainties in its parameters, especially in the delays. Also, the impulsive vaccination possesses the same effect as in the example of the ideal case, that is, it increases the immune by 100 individuals at each impulsive instant and could be used to mitigate any potential deviation of the immune population due to the parameters mismatch. More technical solutions could be made for the case of presence of uncertainties, as for instance, the use of observers to estimate the state and the use of estimation-based adaptive control for the case of parametrical uncertainties. This paper has dealt with the proposal and subsequent investigation of a time-varying SEIR-type epidemic model of true mass-action type. The model includes time-varying point delays for the infected and infectious populations and distributed delays for the disease transmission effect in the model. The model also admits a potential mortality associated with the disease, a potential lost of immunity of newborns at birth, the presence of threshold population residuals in the infected and infectious populations as well as the contribution to the disease propagation in the local population of potential outsiders taking part of a floating population. A combined regular plus impulsive vaccination strategy has been proposed to remove the disease effects, the second one being used to correct major discrepancies with respect to the suitable population trajectories. The main issues have been concerned with the stability, positivity, and model-following of a suitable reference strategy via vaccination. Also, an example for the influenza disease has been given. The authors thank the Spanish Ministry of Education support by Grant no. DPI2009-07197. They are also grateful to the Basque Government by its support through Grants nos. IT378-10, SAIOTEK S-PE08UN15, and SAIOTEK SPE07UN04 and SPE09UN12. The authors are very grateful to the reviewers for their useful suggestions to improve the manuscript. Furthermore, converges exponentially to zero if the second constraint is strict within some subinterval of of infinite Lebesgue measure. Substituting in the above equation the solution (3.3) of and the equality for any initial conditions , it follows that for any and if and only if (4.3) holds. for any and it follows that for any and which holds if and only if (4.6) holds, . for any and it follows that for any and which holds if and only if (4.9) holds, . so that for any and if and only if (4.12) holds, . (a) If and , then from (2.1). Since and is continuous, it suffices to prove that if for some then for some sufficiently small . This holds from (2.2) if and only if either (guaranteed by the first part of the logic "or" of (4.14), or on some interval of nonzero measure, guaranteed by the second part of the logic "or" of (4.14), that is, if (4.14) holds. Then, for , some . The necessity follows by contradiction since and on some interval of nonzero measure implies the existence of such that . Similar to the proof of Assertion 6 by using (2.3) with and replacing . This guarantees at a time instant or within an open interval containing if . Then, is nonnegative for some interval if (4.15). Similar to the proof of Assertion 6 by using (2.4) with and replacing . This guarantees at a time instant or within an open interval containing if . Then, is nonnegative for some interval if (4.16) holds for the given regular vaccination rule. Also, is always nonnegative since for any impulsive vaccination law (see (B.22) in Appendix B). The constraint together with the remaining valid ones of Assertion 9 imply from (2.2) so that the proof of Assertion 9 remains valid. The following result gives conditions for the impulsive-free vaccination SEIR model (2.1)–(2.5) to be a positive dynamic system in the sense that any solution is nonnegative for all time under bounded absolutely continuous initial conditions , eventually subject to a set of isolated bounded discontinuities. Several cases can occur, namely the following. Assume that so that does not exist. Since the unique solution of (2.1)–(2.4), subject to (2.5), is continuous on for each admissible set of initial conditions , it follows that and . As a result, all the populations of the SEIR model (2.1)–(2.5) are nonnegative for all time and the result is proved for this case. Assume that exists with with the following potentially possible included cases. since , and . Then, for some and hence by constructively extending the above reasoning to decompose as a disjoint union of real positive intervals of nonzero bounded measures, that is, Condition (b) of Assertion 5 is guaranteed provided that . and some if and only if (4.14) holds, that is, if and only if Assertion 6 holds so that . Then, provided that .
. If Condition (4.15) holds for , then Assertion 7 holds and for some .
. If the impulsive vaccination function is null and Condition (4.16) holds for , then Assertion 8 holds and for any positive continuous vaccination law for some . whose solution in is unique for given initial conditions and forcing function. Thus, in which leads to a contradiction.
. Take (B.20) for , provided that the prefixed in Assertion 11 satisfies and is calculated from (5.1) in Assertion 11, under given initial conditions , with what implies that . Then, (B.20) becomes equivalently with the suited reference infected population differential equation satisfying (2.2) by construction. under the same initial conditions with being given by (5.2) after using Assertions 11-12. The vaccination law (5.5)-(5.6) makes the immune population to track the reference one which is the unique solution of (2.4) for a given set of admissible functions of initial conditions. This one is achievable for all time by the reference susceptible population which is achievable for all time by the reference infected one (Assertions 12-13) while satisfying the differential equations (2.3), (2.4), and (2.1). The infected reference sequence is achieved by the reference infectious one for all time (Assertion 11) while satisfying the differential equation (2.2). The proof is complete from Picard-Lindeloff theorem for existence and uniqueness of the solution of (2.1)–(2.5) for each set of admissible functions of initial conditions.